TSH (most people feel best when TSH is 1.5 – 2), Free T3, Free T4, Reverse T3, Thyroid Antibodies. Even when thyroid tests are “normal” people may be hypothyroid. We always want to collect a thorough health history and consider symptoms and basal temperature, and not just rely on a TSH lab test. Dr. David Brownstein is a Board-Certified family physician and is one of the foremost practitioners of holistic medicine. I viewed a video where Dr. Brownstein discussed a patient named Carol. “Remember Carol, the schoolteacher who gained 100 pounds during her pregnancy and literally became disabled due to her thyroid problem? Although she had “normal” thyroid tests, she had a low basal body temperature and many classic symptoms of thyroid imbalance. If your thyroid is not working correctly, it did not get that way overnight. And getting it back to normal function will not occur overnight, either. First Thing Tomorrow Morning . . .
Before bed, shake down your thermometer and put it on your nightstand. 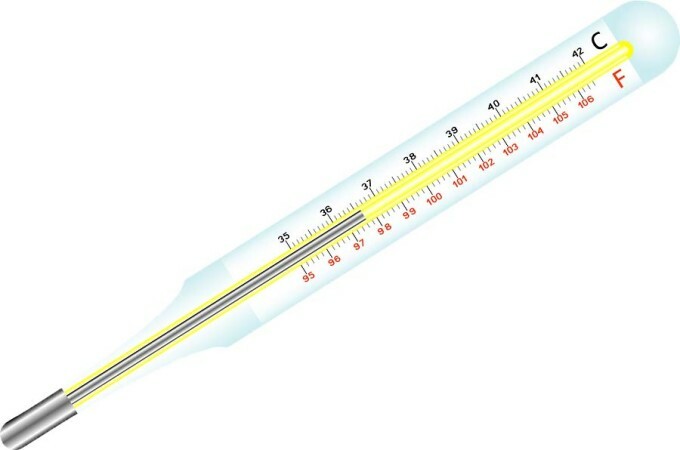 Purchase a mercury-free glass thermometer like this one. In the morning, as soon as you awaken, put the thermometer in your armpit and take your temperature for 10 minutes. Do this five days in a row and record your results. Don’t get out of bed until the 10 minutes have passed or the information won’t be correct. If you are a woman who is menstruating, you should start this on the second day of menstruation. Otherwise, it makes no difference when you start. If your thyroid function is normal, your temperature should be about 97.8 to 98.2 degrees Fahrenheit. A temperature below this may indicate a hypothyroid condition. A normal basal body temperature, under the arm, is between 97.8 and 98.2 degrees Fahrenheit. If you take the basal body temperature orally, add a degree to those numbers. Women who are menstruating should not take their basal temperature during the first few days of their period. EndoFlex™ can help you maintain overall vitality with a proprietary blend of essential oils that support the endocrine system. Ingredients: a base of sesame seed oil, spearmint, sage, geranium, myrtle, nutmeg, and German chamomile. Apply 2 drops over neck daily. Coconut Oil (medium chain triglycerides) can increase daily energy expenditure (study), decreasing weight gain while increasing metabolism. Coconut oil stimulates thyroid hormone production. Gluten-free Real Food diet (not processed gluten-free foods). There is a strong link between autoimmune thyroid disease and gluten intolerance. Even when gluten is consumed rarely, the immune response that is triggered can last up to six months. Avoid gluten at all cost! Supporting nutrients: Zinc, selenium, iodine, tyrosine, Omega-3 fatty acids. Mercury can block the conversion of T4 to the active thyroid hormone T3. Eat 3 Brazil nuts a day to get adequate selenium. Study: selenium supplementation decreases anti-thyroid antibody levels and improves the ultrasound structure of the thyroid gland. Work with a functional medicine MD and avoid synthetic thyroid hormone medication. I recommend WP Thyroid, a desiccated thyroid medication without the junk additive ingredients.